This study’s sensational finding – “there is no evidence that Wal-Mart has had a significant impact on the overall size, growth, or profitability of the U.S. small business sector” – has not only attracted local and national media attention. Wal-Mart has developed a fact sheet on the study, which is being distributed in communities where the company wants to build. A close inspection of the study by the Institute for Local Self-Reliance, however, found fatal flaws. Most remarkable, the study’s authors apparently lack an understanding of the definitions used by the U.S. Census Bureau and are in fact using the wrong dataset. Big-box retailers lost more than half of the local ballot measures decided by voters between 2000 and 2006, according to a new study. But the trends indicate that corporate retailers are spending more money on these campaigns as time goes by, making it harder for citizens groups to prevail. In the 1990s and early 2000s, most big-box ballot measures were initiated by local civic and grassroots groups. But in the last few years, large retail chains and shopping center developers have been increasingly using ballot initiatives to gain approval for projects that have been rejected by city officials or to overturn local ordinances that restrict retail development. They typically begin by hiring an army of paid signature gatherers to qualify the measure for the ballot and then go on to vastly outspend their grassroots opponents on advertising, direct mail, and other campaign tactics. In Davis, California, for example, Target spent $300,000 on a campaign to overturn an ordinance limiting retail stores to 30,000 square feet, while a grassroots group, Don’t Big Box Davis, managed to raise only about $25,000. Target very narrowly won the vote. Deep pockets give big-box retailers a formidable edge in these campaigns, prompting a growing number of people to call for laws that bar corporations from bankrolling local ballot initiatives. But despite the spending imbalance, grassroots groups opposed to big-box stores still win many of these fights by running strong, well-crafted campaigns. In Inglewood, California, Wal-Mart spent over $1 million trying to persuade voters to relax local zoning restrictions, but the measure was defeated by a coalition of community groups. Similarly, a citizens group in Damariscotta, Maine, won voter support for a store size cap law, despite heavy campaigning by Wal-Mart. Between 2000 and 2006, there were 67 local ballot measures dealing with big-box development, according to Direct Democracy and Land Use, a study written by Phyllis Myers, a community planning consultant and president of the Washington D.C.-based State Resource Strategies, and published by the Initiative and Referendum Institute. About two-thirds dealt with development on a particular site; most of these referenda sought to overturn a decision by local officials to approve or reject a project. About one-third concerned broader policies, such as a store size cap law or economic impact review requirement. In just over half of these ballot measures, voters came down on the side of limiting big-box development. But such measures are coming before voters more often and more are being bankrolled by big retailers. Of the 67 ballot measures identified by the study, 36 occurred in 2005 and 2006. Big-box retailers spent heavily in many of these campaigns and won 20 of them. 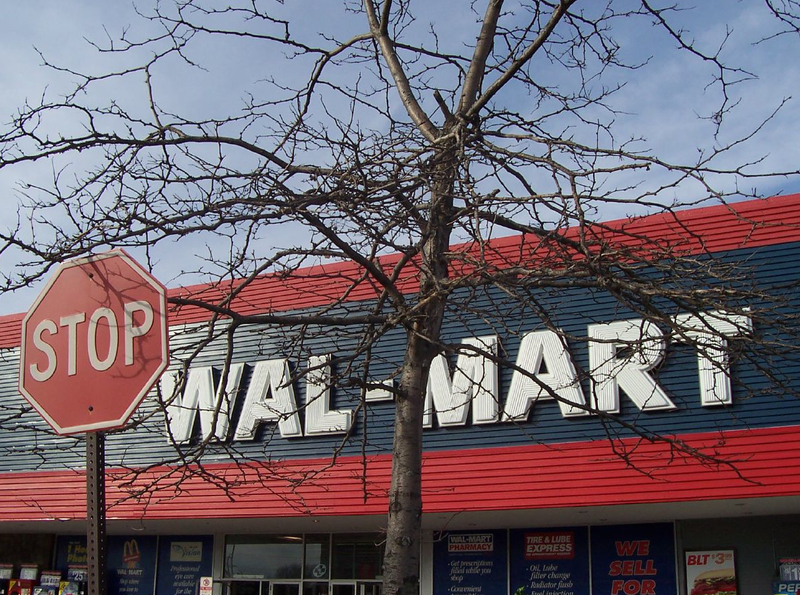 Q: What is the impact of Wal-Mart on local property tax values? Wal-Mart and other big-box retailers can have a negative effect on two types of property: competing business districts and residential neighborhoods next to the store. Homes near the big-box store may also decline in value. These massive developments create significant amounts of noise and traffic, both of which tend to lower residential property values. This compilation of news stories provides a good sense of the severity of noise and nuisance issues that nearby residents commonly experience after the opening of a big-box store. This collection of code violations, demonstrates how Home Depot is a careless neighbor; receiving numerous infractions for noise, improper trash disposal, and fire code and hazardous material violations. Also, see our fact sheet on the “Impact of Big-Box Stores on Traffic”. How much these noise and traffic issues may affect home values depends on local circumstances. We recommend that you hire a real estate appraiser to assess the likely impact of a proposed big-box development on property values in adjacent neighborhoods. His or her findings may be very useful in making your case to the community and elected officials. You can expect a Wal-Mart supercenter to receive about a dozen truck deliveries every day, or about 80-90 per week. Some of the most reliable figures on the number of truck deliveries generated by big-box stores can be found in the Environmental Impact Reports (EIRs) that California state law requires cities to prepare for large retail projects. Unlike the figures put forward by developers and retailers, the data in these reports has been independently verified. Delivery trucks create noise and pollution that can undermine the peace and health of surrounding neighborhoods. Diesel particulate matter (DPM), which is contained in the exhaust of diesel trucks, pollutes the air and, according to the EPA, probably causes cancer. Many people who live near big-box stores have complained about excessive noise from trucks, forklifts, and idling engines. Sometimes noise levels even violate local noise ordinances or promises made by the companies themselves prior to building. Of particular concern are deliveries made at night, a time when many retailers prefer to re-stock their shelves. Dark stores are indeed a fast-speading plague. The U.S. is now home to thousands of empty big-box stores and hundreds of vacant shopping centers and malls – perhaps as much as one billion square feet of empty retail space altogether. Part of what’s fueling this epidemic is that, in their quest for greater market share, big-box chains like Wal-Mart and Home Depot have built far more retail space than consumers can actually support. Between 1990 and 2005, the amount of retail space in the U.S. doubled, while per capita income, adjusted for inflation, grew by only 28 percent. Also contributing to the problem is that fact that many chains reinvent themselves every decade or so, abandoning their older outlets for new formats. Wal-Mart, for example, has been vacating its earlier generation of stores to build supercenters that are twice as large and include a full grocery department. As of early 2006, the company had more than 300 vacant or soon-to-be-vacant stores across the country. These derelict boxes tend to remain empty for many years, causing blight and eroding nearby property values. Retailers often hang on to these empty buildings or, in the case of leased sites, continue to pay rent, in order to prevent their competitors from occupying the locations. Cities occasionally find non-retail uses for these old shells, but that’s relatively rare. Curbing the construction of new big-box stores and shopping centers is the only real solution to the epidemic of retail vacancy. Cities and towns need to recognize that the vast majority of new retail development projects proposed today are driven not by growth in consumer spending, but by the developer’s belief that the new store or shopping center will grab market share from established businesses, which in turn will contract and close. Most cities and towns have zoned far more land for retail than they actually need or can support. As chain stores sprawl on the fringe, older shopping centers and historic business districts almost invariably struggle and decline. The fastest to end up with a vacant 100,000-square-foot Wal-Mart store is to approve a new Wal-Mart supercenter. Limiting where and how much land is open for retail development, especially big-box stores, forces retailers to redevelop existing centers rather than leaving them vacant and moving on to greenfields. It also encourages developers to employ higher quality, more durable construction and to make maximum use of the available land (by, for example, developing multi-story buildings that have offices or housing in addition to retail). In addition to limiting how much land is zoned for retail, cities can also use store size caps to prevent big-box sprawl and economic impact review requirements to analyze the need for new retail stores before projects are approved. Some cities, such as Oakdale, California, now require that retail developers set aside money in a performance bond, which is held in escrow and can be used by the city to demolish the structure and maintain the site should the store or shopping center become vacant. Often retailers continue to pay rent after they have vacated a building in order to block a competitor from taking the location. Or they may include clauses in their leases that require the property owner to obtain their approval before renting the site to a new tenant. Some cities, such as Peachtree City, Georgia, have adopted ordinances that prevent this by mandating that landlords are free to place retail properties on the market as soon as they become vacant. These ordinances make no difference if the retailer owns, rather than leases, the property (this is less common, but true in perhaps 15 percent of the cases). They also are ineffectual if there is no market for the abandoned store, which is common given how much open space is currently zoned for retail development, the limited number of companies that are suited for stores several acres in size, and the fact that most retailers prefer to build new structures to suit their specific formats. The city’s ordinance mandates that developers include specific design elements when constructing large stores to facilitate re-use by multiple tenants (e.g., provision for interior subdivisions and multiple entryways). These plans are reviewed as part of a conditional use permitting process. This approach has its limits too. It will not help if the owner does not wish to redevelop and release the property, or if there is no market for the abandoned site.